I am in the same boat as Jay when it comes to Horrible Bosses – I do not remember the first movie at all. That probably means we went to the drive-in and were not watching the movie, which is fine by me! 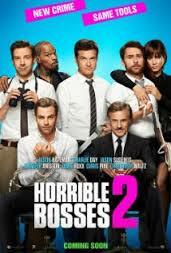 Anyway, I do remember watching Horrible Bosses 2 because I just saw it last night, and laughed a lot. I laughed even though this movie is not particularly clever or innovative and really makes no sense when you think about it (spoiler alert: why not try to sell your 100,000 Shower Buddies to someone else?) until you take Jamie Foxx at his word that NickKurtDale are the craziest criminals he has ever met. They just like doing this sort of stuff and I guess on that reasoning it makes perfect sense that when they run into adversity they start hatching illegal schemes (which may or may not involve zip lines, trampolines and skateboards). I laughed because these three guys (Jason Bateman, Jason Sudekis and Charlie Day) have such good chemistry and clearly are having fun every step of the way, often at each other’s expense. And I don’t think that’s character-driven, because there isn’t a whole lot of acting going on. That’s not even a criticism – I wasn’t there to see acting, I was there to laugh, and mission accomplished on that front. It’s not an Oscar winner but it’s about as much fun as you can have at the movies when the drive-in is closed for the winter. Well executed and surprisingly good, Horrible Bosses 2 is one to watch, preferably with a few good friends who could help you plan a kidnaping if it ever comes to that. This entry was posted in Movie Reviews and tagged buddy movies, Charlie Day, Chris Pine, christoph waltz, Half-assed, Jamie Foxx, Jason Bateman, Jason Sudeikis, Jennifer Aniston, unnecessary sequels on December 3, 2014 by Jay.